I received a PM about the Vuichard Recovery, so I thought I would answer it in the open forum. The maneuver they are now calling the Vuichard Recovery, is an informal facelift of a maneuver that has been around for a long time. It was known long ago in technical circles, that any forward, lateral, or edge-wise movement of the rotor would aid in the recovery from VRS. For the single rotor helicopter it was commonly understood that forward cyclic and reduce collective was the easiest to accomplish; therefore, it became the norm. For the tandem rotor lateral movement became the norm. In general context, the technique is valid under certain circumstances. With the so-called Vuichard Recovery we’re trying to accomplish the lateral movement with the tail rotor thrust and whatever main rotor thrust is left with cyclic control from a main rotor engulfed in vortex turmoil. The question is, how effective is this technique, is it more effective than the old standard technique, lower collective-forward cyclic? The more compelling question is, are these claims of immediate recovery from fully developed VRS within only 20 - 30 feet valid. For VRS to occur, the upward component of velocity normal to the rotor disk plane must be a substantial fraction of the average induced velocity downward through the rotor disk. Our knowledge of the VRS comes from flight and wind tunnel tests. Based on this experience, we know that unsteadiness starts between .25 - 0.5, peaks at .75 – 1.0, and disappears at 1.5 times the hover induced velocity. The fully developed VRS is encountered at the so-called sweet spot, where we experience severe turbulence and thrust variations worthy of its name. it’s a very unstable state which makes it very difficult to hold flight position for any length of time. It’s at time even difficult to hit that sweet spot, in order to experience is full effects. Another area of concern, pilots sometimes have difficulty recognizing the difference between VRS state and settling with power, much less which technique to use under each of those circumstances. Forward cyclic and reduce collective works for both. For the so-called Vuichard Recovery that may not be the case, further analysis is needed. 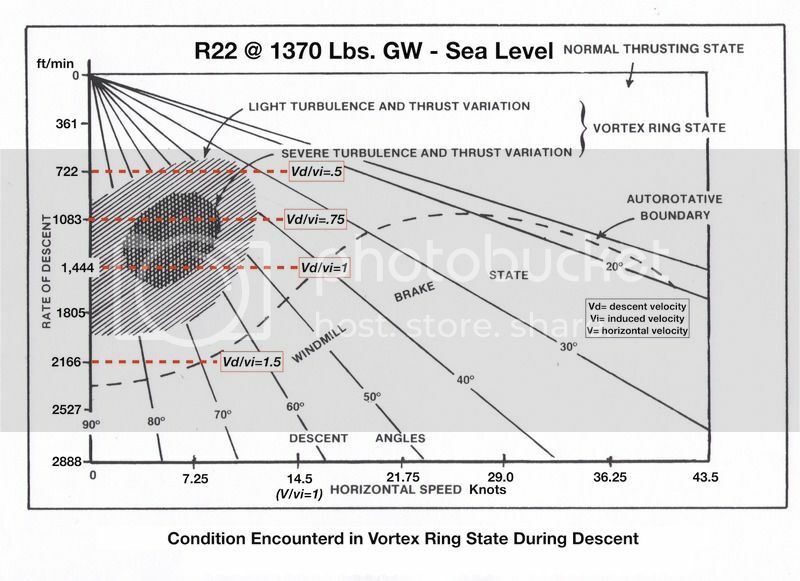 From the chart below, the R22 needs a descent rate of 1083 ft./min .75 (75%) of the induced velocity to reach into a fully developed VRS. Take note that the 1083 ft./m descent rate equates to 18 ft./s descent rate. In other words, to accomplish the 20 to 30 ft. recovery from a fully developed VRS encounter, you would have to start, arrest the descent, and complete the recovery within 1.1 to 1.6 seconds. The claims maybe a bit exaggerated due to the way the data was taken and the instrumentation used to take the data. Moreover, it’s very difficult to determine the exact position of the aircraft with respect to the area of severe turbulence, as a result the aircraft ends up in the light turbulence area (the early stages of vortex ring state). As a consequence, the data doesn’t reflect the severe turbulence encountered in a fully developed vortex ring state. This may not be the silver bullet, magic bullet, foolproof, or fix-all as advertised. A more careful and critical examination of the techniques overall capability and suitability needs to be accomplished. · The vortex ring stale (VRS) is worthy of some special further discussion. This is because in the VRS the rotor can experience highly unsteady flow with region of concurrent upward and downward velocities, and the flow can periodically break away from the rotor disk. This flow state appears to have been first recognized by de Bothezat (1919) and such flows have been visualized and measured in helicopter rotor experiments by Lock et al. (1926), Castles. & Gray (1951), Drees & Hendal (1951), Yaggy & Mort (1963), Washizu et al. (1966), Azuma & Obata (1968), Moedersheim et al. (1994), and others. · While operation in the VRS is obviously undesirable, it can be entered inadvertently through poor piloting technique. Recovery is usually attained quickly, however, by the application of cyclic control inputs to cause some increase in forward or sideward airspeed to sweep the recirculating wake away from the rotor disk. · Instrumented flight tests documenting the VRS behavior of helicopters are sparse, mainly because it is a difficult flight condition to sustain any form of equilibrium flight. The flight tests of Brotherhood (1949), Stewart (1951), and Scheiman (1964) have documented the highly unsteady blade loads and high rotor power requirements found during flight in the VRS. Edited by iChris, 31 December 2015 - 22:41. Lots of good info here. Not trying to change the subject but I thought Vortex Ring State and Settling with Power were the same thing? I'm in the Army and that's how our manual words it anyways. Maybe it's wrong or they just generalized it. Something to the effect of "Setting with Power, also known as Vortex Ring State,...."
Yes it is being taught as the same, but power settling is not something talked as much about. Today's discussion on running out of power tends to go along the lines of MAP chart discussions in flight schools and rarely do the two topics come about in the same train of thought. This new technique that is going around does work very well. Edited by WolftalonID, 28 December 2015 - 15:36. Now as for the “Vuichard Recovery,” I was introduced to the technique while teaching a Robinson Pilot Safety Course in Neuchatel, Switzerland in June 2011. The previously mentioned Vuichard was one of the attendees. During the flight portion of the course, in a Robinson Helicopter R44, I went over the standard vortex ring state recovery technique that had been taught to pilots here in the U.S. for more than 60 years. Vuichard is a helicopter pilot of more than 35 years with more than 16,000 flight hours. This supposed student then asked me if he could demonstrate a recovery technique that he had developed over the years as a pilot conducting long-line operations in the Swiss Alps. I’m normally fairly reluctant to heed such requests from a trainee who wants to “show me” one of his or her own techniques. This is especially true outside the U.S., where I’m not familiar with local standards and practices. But in this case, I hesitantly agreed. Rather than forward cyclic and reduce collective (as I have been teaching and evaluating for years), he actually increased the collective to climb power, added the appropriate left pedal to keep the nose straight and applied right cyclic. The combination of tail rotor thrust and right bank moved the aircraft to the right and almost immediately out of the vortex ring. I was amazed. After a little practice, I was making recoveries from a fully developed vortex ring state with only 20 to 30 ft of altitude loss. For the past two years, we have been teaching the Vuichard Recovery with great success in the safety courses at Robinson’s Torrance, Calif. plant and abroad. Additionally, I have included it in the maneuver guides for R22, R44 and R66. Pilots quickly see the recovery is accomplished more efficiently with much less altitude loss than the traditional method. Tim demonstrated these repeatedly at our August USHST face to face meeting. ERAU staff members and Robinson are working on producing data to publish. Here is a link to the R&W article. The terms are often used interchangeably; however, they’re distinct and they can be thought of as a cause and effect relationship. Settling with Power / Power Settling – Entering into a flight condition where the required power is more than the available power. Any condition of powered flight in which the helicopter continues to descend regardless of the power applied to arrest the descent. • During the initial stage (when a large amount of excess power is available), a large application of collective pitch may arrest rapid descent. If done carelessly or too late, collective increase can aggravate the situation resulting in more turbulence and an increased rate of descent. • In single-rotor helicopters, aviators can accomplish recovery by applying cyclic to gain airspeed and arrest upward induced flow of air and/or by lowering the collective (altitude permitting). Normally, gaining airspeed is the preferred method as less altitude is lost. • In tandem-rotor helicopters, fore and aft cyclic inputs aggravate the situation. By lowering thrust (altitude permitting) and applying lateral cyclic input or pedal input to arrest this upward induced flow of air, the aviator can accomplish recovery. Taghizad, et al. found the main vortex ring state characteristic to be a sudden drop in vertical velocity Vz . An increased level of vibrations was observed when the VRS area was approached. Then VRS started by a sudden increase in the rate of descent. Increasing collective did not stop the Vz fall. During the fall, the helicopter was very unstable and hard to control. VRS effects disappeared beyond a forward velocity of approximately Vx /vh = 1. In a VRS encounter, the pilot's instinctive reaction to the sudden increase in rate of descent was to increase the collective level to stabilize Vz , but the rate of descent was generally insensitive to collective. Increasing collective was an uncertain way to quickly leave VRS, but a forward velocity increase stabilized the rate of descent. Taghizad, et al. concluded that flight in vortex ring state was unpredictable. Two VRS flights starting from close conditions could imply very different helicopter reactions. This chaotic behavior is probably explained by the turbulent flow producing VRS. For the majority of tests, a collective increase alone did not permit the helicopter to leave the VRS regime. Nevertheless, and in contrast to the common assumption, collective increase did not amplify VRS effects. The helicopter was generally insensitive to this command within the VRS area. Collective increase to a level greater than the hover value allowed the helicopter to leave VRS in a few cases, but this behavior was not predictable. Edited by iChris, 31 December 2015 - 22:28. Push forward...lean sideways...it's all theoretical. Theoretical in that it doesn't matter much which technique you use. See, VRS/SWP doesn't usually occur up high when you have plenty of time to react - unless you're doing some high OGE hovering for some reason (survey, movie or photo shoot, etc.). No, your encounter with VRS/SWP will probably happen down low, at the bottom of an approach, where your altitude might not leave you with many options. I always chuckle when young aviators recite the "requirements" for VRS/SWP as if they are absolute. They act as though it is only the rate of descent of the fuselage of the aircraft that matters. But Mother Nature knows better than you. What if you were making an approach to someplace and got caught in an updraft?...maybe a sustained updraft? You think you're golden because you're keeping your approach parameters out of the VRS-range...but now suddenly you're in them and the bottom drops out. Whoa! So talk all you want about Senor Vuichard's recovery technique. It probably won't do you a whole lot of good if you get into VRS/SWP at a 200' short-final to a confined area. At that point you done f'ed-up. The good news is that we're not really crashing a whole bunch of helicopters to VRS/SWP anymore. Maybe it's better edumacation...or maybe helicopters have enough power now (good-bye Franklin engines!) that the SWP portion of the equation is diminished and only the VRS portion remains. And we know now that you can't get below ETL and just come pretty straight down into your LZ. Or at a steep angle with a slight tailwind. We know these things. We've had guys like Ray Prouty and Shawn Coyle explain it to us. We're smarter now. There's a Navy book or video, wish I had a link, that proved that VRS cannot happen unless your angle of decent is more than 30 degrees. Also, the Army HAAT training book I remember reading a similar blurb. The Army’s Field Manual (FM3-04-203) you speak of also include some additional information that is consistent with flight and wind tunnel testing. • The vortex ring state can be completely avoided by descending on flight paths shallower than about 30 degrees (at any speed). • For steeper approaches, the vortex ring state can be avoided by using rates of descent versus horizontal velocity either faster or slower than those passing through the area of severe turbulence and thrust variation. 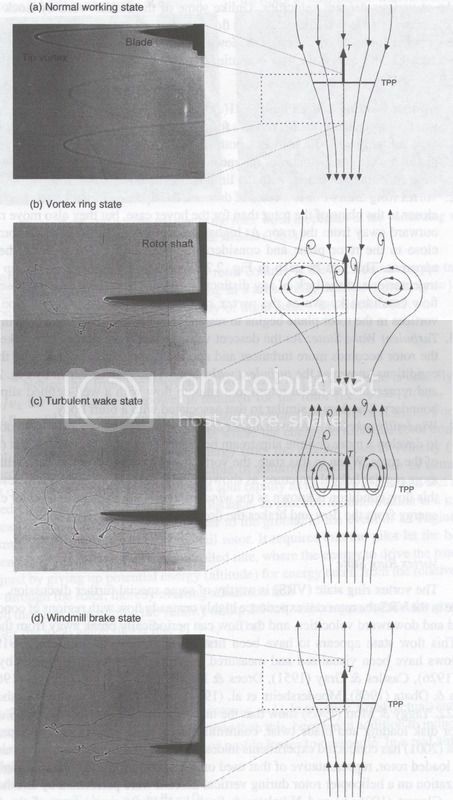 • At very shallow angles of descent, the vortex ring wake is dispersed behind the helicopter. Forward airspeed coupled with induced-flow velocity prevents the upflow from materializing on the rotor system. • At steep angles, the vortex ring wake is below the helicopter at slow rates of descent and above the helicopter at high rates of descent. Low rates of descent prevent the upflow from exceeding the induced flow velocities. High rates of descent result in autorotation or the windmill brake state. We can also add-in, the vortex ring state can be completely avoided on any descending flight paths at a forward airspeed at or above 30 kt..
Again, as stated above, For VRS to occur, the upward component of velocity normal to the rotor disk plane must be a substantial fraction of the average induced velocity downward through the rotor disk. Our knowledge of the VRS comes from flight and wind tunnel tests. Based on this experience, we know that unsteadiness starts between .25 - 0.5, peaks at .75 – 1.0, and disappears at 1.5 times the hover induced velocity (vi). As an example, looking at the R22 and R44 (Note, they both have similar disk loads, 2.75 and 2.8 respectively @ gross wt.). The R22/R44 @ GW would be clear of VRS at a descent rate at or below 700 ft./m or 600 ft./m conservatively at any airspeed, with OGE capability at that altitude. Edited by iChris, 01 January 2016 - 13:50. The demonstrations are another red flag. I’ve talked with students who are being shown high descent rates into a so-called VRS to demonstrate now great this new Vuichard technique is. They go up to 5500 feet and the CFI would setup a so-called VRS demo with a recovery at 2500-3000 ft./m. VRS is only encountered when the velocity normal to the rotor disk is a substantial fraction of the average induced velocity downward through the rotor disk. In this case, they’ve passed through the vortex ring state’s boundary and now in a zero airspeed vertical descent/autorotation. Well intentioned instructors show a fast descent, some vibration and then an impressive vertical autorotation, and call the whole thing VRS. Any more than a 2100ft./m rate of descent (R22/R44), you’re on longer in the VRS boundary. That’s why they’re obtaining such excellent results, 20 and 30 feet recoveries. Especially, if you have HOGE capability at that altitude. And yes, there will still be some vibrations because you’re transitioned out of the vortex ring state through the turbulent wake state were the vibrations are starting to decrease and are no where near the severe turbulence and thrust variations characterized by the VRS. Edited by iChris, 31 December 2015 - 22:36. The good news is that we're not really crashing a whole bunch of helicopters to VRS/SWP anymore. That’s right, if the VRS beast grabs a hold of you, close to the ground, he’s not likely to let go no matter what technique you use. VRS is a very small percentage of the accidents. Most of the so-called VRS accidents result from the old power settling or settling with power, which are helicopter performance issues, mostly related to the power available versus the power required. VRS is an aerodynamics issue. As aerodynamics concerns the motion of air and the forces acting on objects in motion through the air. Edited by iChris, 31 December 2015 - 22:01.